Philatelic Bureau have confirmed these stamps will be sent to customers who have Cylinder Panes on their standing order. No date given though. I contacted Tallents House and was informed that the distribution to Non Visible Change customer's would be some time in December. So after these NVC stamps have been circulated, what further issues can we expect to complete the Walsall printed Machins ? RM Signed For Standard, RM Signed For Large, and the 50p. Perhaps the delayed December issue date is to allow for this. Also is there any chance that Walsall will reprint the High Values £1.50, £2, £3, £5 ? I have heard that these are only available for philatelic use at Tallents House, and not in Post Offices. Also how about 1st and 2nd class standard from coils, could these ever be reprinted on SBP2 ? The high values are available from Royal Mail's website (£5 - https://shop.royalmail.com/postage-and-packaging/50-x-pound-5-00-self-adhesive-stamp-sheet) not just for philatelic use. So the remaining stamps are the Signed For and the 50p, which may be reprinted although demand for the 50p is probably low and it was reprinted in 2017. Of more importance is whether the business sheets turn up - as most of the booklets have done - with the yellow fluorescence in the transparent security ink. 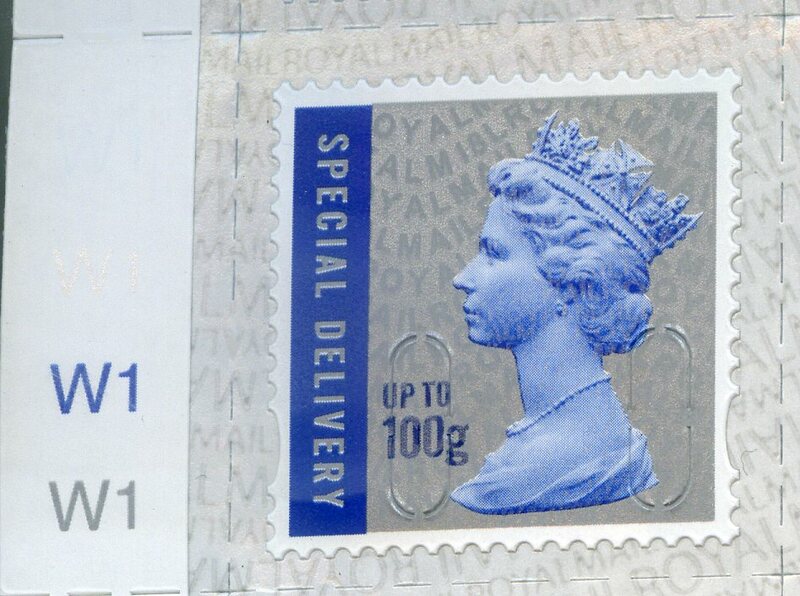 The printing date for the Special Delivery 'up to 100g' is the same as the 500g version which is 17/07/18. It is also printed in the blue colour and not black as all other counter sheets. I hadn't noticed that Brian. Is the FSC logo and barcode in blue or black? All the sheet marginal marking except the colour name which is printed in the silver are printed in the dark blue. Many thanks for the information regarding the PPIs Ian. 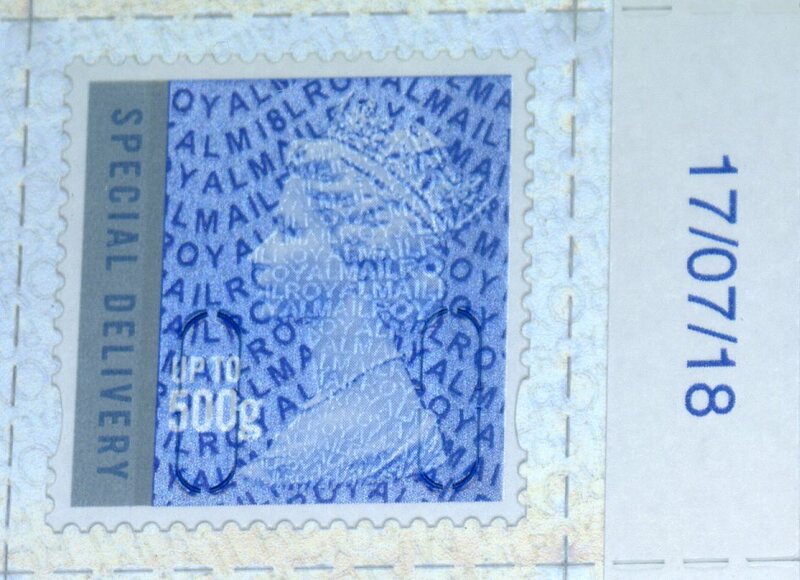 I now recall neatly cutting one from an envelope to display in my collection as an example. I have a standing order for NVCs, so it's just a case of being patient until they turn up. I have received an Order Advice Note from Tallents House re. the Harry Potter Prestige Book 4/12/18. The order also adds NV Changes. The total amount is £49.13. I presume this is made up as follows: Harry Potter £31.00 [I have 2] Special Delivery 100g £6.50. 500g £7.30. Signed For Standard £1.77. Large £2.11. Postage 45p. total £49.13. So we now just wait for the Walsall printed 50p and the high values.